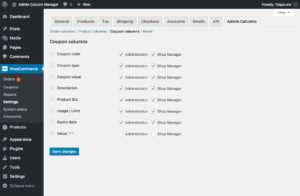 Admin Column Manager is a WordPress plugin for WooCommerce that enables you to manage the product, order and coupon admin table columns by removing default columns, adding additional predefined columns and changing their order. Clean up the admin environment to your own or your client’s liking by applying the configuration for Administrator and Shop Manager user roles separately. 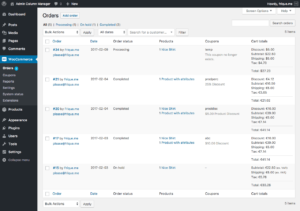 Clean up the WooCommerce admin interface for yourself or your clients by removing columns that you don't need. The plugin comes with a bunch of predefined additional columns for your convenience and completely optional. Reorder the columns to your liking with a drag&drop interface. Besides hiding the default columns, you can choose to add any of these additional information columns to the following WooCommerce list tables. More columns are added over time! The times this product has been sold. The product excerpt if it exists. List of product attributes, similar to the tags display. A product's avarage star rating and the number of reviews. A simple textual display wether the product is featured or not. An alternative to the default icon view. A simple textual display of the product type. An alternative to the default icon view. This column used to be default but was removed in WooCommerce 3.4. With Admin Column Manager you can add it back in. An overview of products in the order. An alternative to the default "order items" column which was removed in WC 3.0. Shows wether a coupon was used on the order, which one and what its value was. A representation of the costs, tax, discounts and totals of the order. A simple textual display of the payment method used on the order. A simple textual display of the order status. An alternative to the default icon view. Shows a preview of the customer message if one was provided. Shows the latest order note. Information on the value of the coupon. 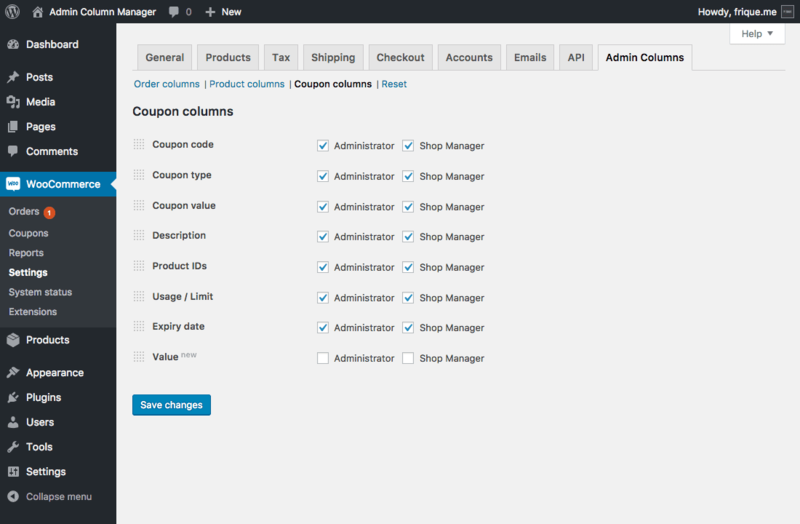 Already own Admin Column Manager for WooCommerce and need help? Click here for support and documentation. Will this plugin mess with any of my WordPress or WooCommerce settings? Why can't I see the settings page? How do I add columns? How do I remove columns? How do I revert back to the defaults? A column is checked to be visible but I don't see it. No. Enabling the plugin leaves everything in the same state until you save the plugin options to apply your customizations. Reverting the plugin configuration back to default and/or disabling/uninstalling the plugin will leave everything as it was before you installed the plugin. 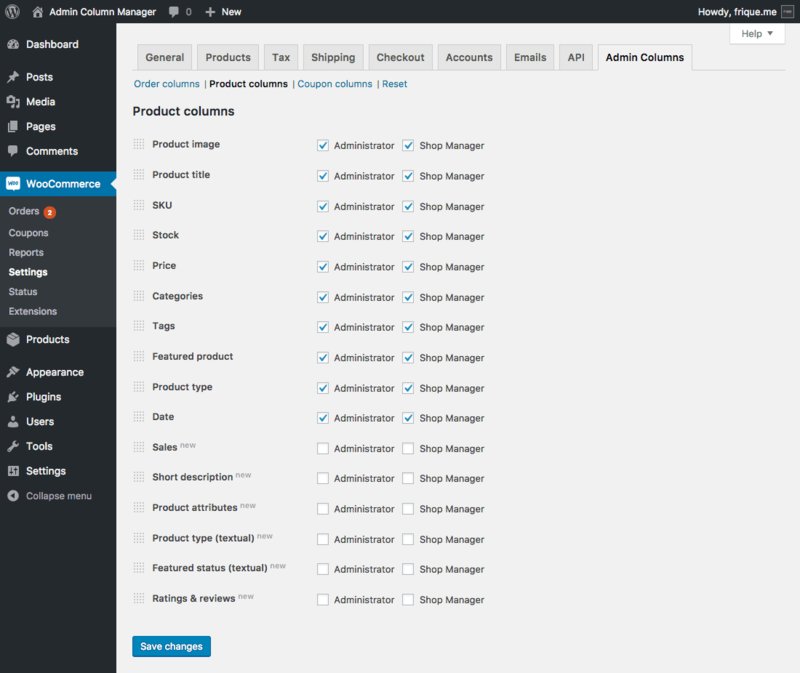 Visit WooCommerce > Settings, and find the “Admin Columns” tab on top. On top of that page you’ll find links to switch between orders, products and coupon columns, as well as a page with the option to reset the column settings. Why can’t I see the settings page? 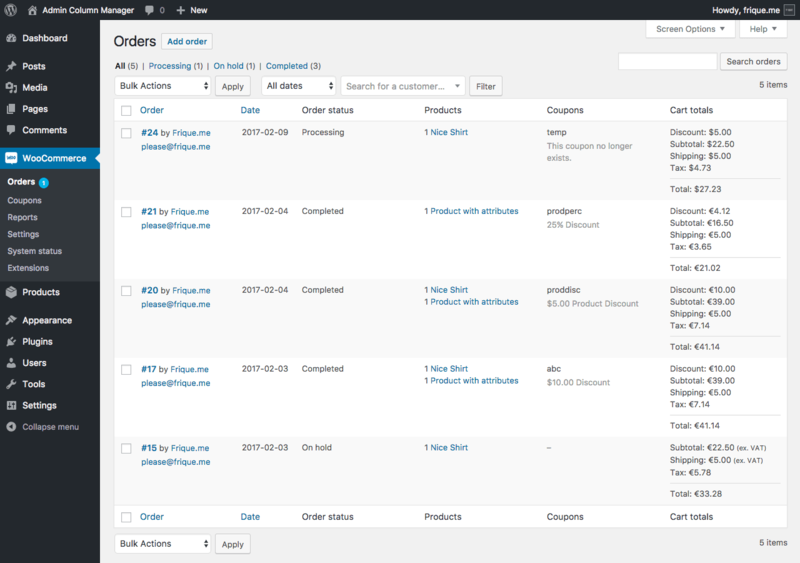 On the settings page, you find lists of columns for orders, products and coupons. Each list item has a dotted grid icon to the left of it which can be clicked and dragged. Drag and drop the list items as you prefer and press “Save changes” to save this configuration. The next time you visit the corresponding list table page you’ll see your custom order reflected. You can add any of the predefined additional columns by checking the checkbox behind it on the settings page. Press “Save changes” to confirm your custom configuration. You can hide/remove columns by unchecking the checkbox behind it on the settings page. Press “Save changes” to confirm your custom configuration. Visit WooCommerce > Settings > Admin Columns > Reset. Here you’ll find a button to reset the configuration. Any changes made by the plugin are reverted to the situation you had before using this plugin. A column is checked to be visible but I don’t see it. If you have hidden a column via “Screen Options” on the corresponding page with the current user account, it will stay hidden even though it’s enabled in the Admin Column Manager’s configuration. To see the column after it’s been hidden in Screen Options, open Screen Options again and check the checkbox. The show/hide state via Screen Options applies to each user account individually. Fix a possibility of the dragging of WooCommerce attribute terms not working. Removed a debug log message in the plugin code. Improved automatic column widths for order/product/coupon tables, preventing the checkbox and other narrow columns from taking too much space in certain situations. Added the "Product Type (icon)" column since this native column was removed in WooCommerce 3.4. Fix a bug where the coupon column ordering was not being applied. Removed the plugin column "Textual order status" (orders) since this is now what the new default order status column looks like. Added a new plugin column "Order notes" (orders) since this is now removed as a default column. Added a new plugin column "Customer message" (orders) since this is now removed as a default column. Updated styling of the configuration pages. Added Yoast SEO columns to the list of manageable product columns when the plugin is active. Added products column: Ratings and Reviews. Preparations for WooCommerce 3.2 support. Product columns: Sales column: This column is now sortable. Order columns: Products column: Added a "times" character between the quantity and the product title. Order columns: Products column: The text was made internationalizable. Order columns: Cart totals column: Fixed possible "undefined function" error in older WooCommerce versions. Order columns: Cart totals column: Now showing "Refunded" amount if there was any. Order columns: Cart totals column: Not showing shipping entry if there were no shipping costs. Fixed possible "Headers already sent" PHP warning. Fix possible text domain conflict in localized JS. Added order column: Products, which shows the purchased products. This column is similar to the default column "Order items" which was removed in WooCommerce 3.0. Prevented an error in the coupon column when the coupon is since deleted. WooCommerce 3.0 compatibility: Removed the "Order Items" column since this is no longer a default order column since WC 3.0. WooCommerce 3.0 compatibility: Removed errors due to data retrieval method changes. Priority support directly from the developer. Also for pre-purchase questions! Payment is quick and secure and your download will be available immediately after purchase. Options page for the order page columns. Order columns manipulated by the plugin.